Fulfill a contract to deliver blacksmithing goods. I've taken a contract from one of the Writ boards, an agreement to deliver Blacksmith goods to an interested organization. Blacksmith Writs are available to anyone who completes the Blacksmith Certification quest. The quest can be picked off from the Equipment Crafting Writs boards once per day. "Seeking skilled blacksmiths to fulfill simple requisitions! Your goods could make the difference! Carefully examine specific orders as you take them from the board!" 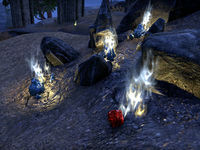 If Coldharbour nor Craglorn area hasn't been visited the quest level is capped at five[verification needed — Is this still true? ], thus Ebony is the highest level. Visiting Coldharbour enables level 6 quests and rewards and visiting Craglorn unlocks all levels. The items needed will always be a mix of weapons and armor, in any of three different combinations. The material needed to craft is dependent on the characters rank in the appropriate skill and also defines the level of the reward received. "Good work, friend smith! Your skill at working metal does you proud. We look forward to dealing with you again." "Your work to support the war effort does you proud. And we imagine that more than one soldier enjoys both the style and effectiveness of your designs." "The Daedra refuse to go down without a fight. Thanks to you and your crafting skills, we can give them a proper one!" "You were never here. We were never here. Let's never mention this again. Thanks." "You have our thanks, crafter. These arms and armor guarantee that the least among us can protect themselves." "Found these in the ruins of a Daedric camp. Your efforts keep us focused on this little corner of Oblivion." "Damned adventurers would be better off hiring us than doing it all themselves! They have a fighting chance thanks to your efforts." "New equipment is so much better than the slightly used materials we collect from the battlefield. Accept this as compensation." "Thanks for keeping the new arrivals stocked. Good luck to you." "The Orsinium Civic Renewal and Vengeance Committee appreciates your work. These supplies now go toward renewing the city of Orsinium. Malacath curse your enemies!" This page was last modified on 5 April 2019, at 06:42.